This holiday craft is fun and easy even for little hands! 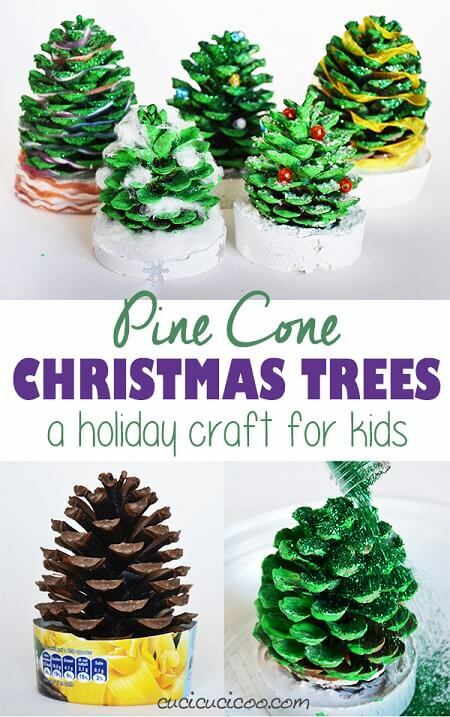 DIY pine cone Christmas trees for kids. They love painting and decorating these pine cone Christmas trees and seeing them come alive. It’s also a great way for them to have something to give to loved ones without having to spend money. Just stick a pine cone in some plaster of Paris, then once it’s dry you paint it and sprinkle glitter on it. Once the paint’s dry, the real fun begins as you decorate the Christmas tree with beads, bells, pompoms, ribbons, buttons or fake snow! So much fun! Check this DIY pine cone Christmas trees out! Yes, they are so adorable!! !